ASM Basket Le Puy-en-Velay (NM2) inked 24-year old Tunisian international center Yassin Debache (207-104kg-94, college: UQAM). 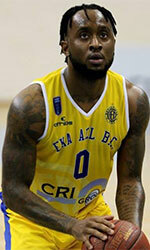 He is the second import player in the roster as Lithuanian Viktoras Chodosovskis signed here earlier. Debache played most recently at Dresden Titans in German ProB. In 10 games he averaged 4.0ppg and 2.5rpg last season. Debache played in the final of RSEQ Tournament in 2017. He was called to Tunisian Senior National Team this year. Debache attended Universite de Quebec a Montreal until 2017 and it will be his second season in pro basketball. Traditionally, every week we bring you a list of the top performances of Tunisians who are currently playing abroad. #1. This week's number one is an international shooting guard Michael Roll (198-87, college: UCLA, currently plays in Israel). He contributed to a Maccabi T-A's victory against the ninth-ranked Ironi Nes-Ziona (9-14) 86-74 in the Israeli Winner League in Tuesday night's game. Roll scored 9 points in only 14 minutes on the court. Maccabi Fox Tel-Aviv (18-4) is placed first in the Winner League. It was his team's sixth consecutive victory in a row. This year Roll averages: 9.8ppg, 2.3rpg, 3.1apg, 2FGP: 52.6% and FT: 92.3%(24-26) in 21 games he played so far. He is a naturalized American. Roll is currently a member of the Tunisian senior national team. Strangely he has never played in Tunisia. #2. Second place goes to an experienced international center Salah Mejri (217-86, currently plays in NBA). Mejri could not help the Dallas Mavericks (29-46) to beat the Miami Heat (38-38). He scored only 4 points and grabbed 9 rebounds. The Dallas Mavericks (29-46) were defeated 105-99 on the road by the Heat. Mejri's overall stats this season are: 2.6ppg, 3.0rpg, 2FGP: 51.9%, 3FGP: 30.8% and FT: 76.9%. He is in the roster of the Tunisian senior national team. #3. The Tunisian player who performed third best last week abroad was an international point guard Omar Abada (189-93, currently plays in France). Abada led Saint Chamond to a victory over the ninth-ranked Poitiers (12-12) 74-66 in the French ProB (second division) on Friday night. He was MVP of the game. Abada scored 19 points and added 5 passes in 27 minutes. Saint Chamond Basket Valle du Gier (16-8) is placed fifth in the ProB. It's Abada's first season with the team. This year his overall stats are: 8.8ppg, 1.5rpg, 2.5apg, 2FGP: 50.8%, 3FGP: 37.7% and FT: 76.4% in 20 games. Abada is also a member of the Tunisian senior national team. #4. Power forward Makram Ben Romdhane (205-89, currently plays in France) is a teammate of previously mentioned Omar Abada and both played together in the last French ProB game. Ben Romdhane helped Saint Chamond win their game against the ninth-ranked Poitiers (12-12) 74-66. He scored 10 points and grabbed 8 rebounds. Ben Romdhane has relatively good stats this season: 11.7ppg, 8.9rpg, 3.4apg and 1.7spg. He is also Tunisian national team player. Defending champion Etoile Sportive Rades (Division I) landed 26-year old American guard Deondre Parks (185-86kg-92, college: South Dakota State). He started the season at AEL Limassol in Cypriot Division A. In 21 games he averaged impressive 18.8ppg, 3.8rpg and 4.0apg this season. The last season Parks played at Cactus Tbilisi (Superleague) in Georgian league where in 32 games he was the best scorer with remarkable 20.8ppg and recorded 3.5rpg, 3.2apg and 1.5spg. Parks helped them to end the regular season as a second best team in the league. They also played in the Cup final. It was a very successful season in his career as he was selected to Eurobasket.com All-Georgian League 1st Team, All-Star Game and All-Imports Team. Parks has played also professionally in United Kingdom (Newcastle Eagles). He attended South Dakota State until 2016 and it is his third season in pro basketball.